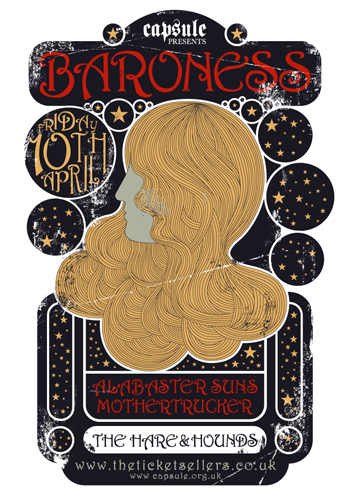 Two more stunning gig posters have been created by artist Ben Javens for our future Capsule gigs, firstly for a show with Savannah, Georgia’s BARONESS (Relapse Records) with support from Alabaster Suns (ex Capricorns) and Birminghams very own thunderous foursome Mothertrucker which takes place on Friday 10th of April. 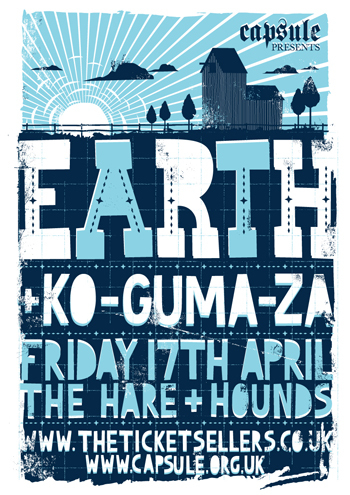 Followed a week later by the godfather of Drone, Dylan Carsons EARTH with support from Ko-Guma-za, which sees the guitar section of Nottingham band Wolves Of Greece reunited for the first time since their involvement with NYC composer Glenn Branca’s orchestra in 2007. Both these gigs will take place at the Hare & Hounds in Kings Heath, advanced tickets are available from www.theticketsellers.co.uk or Polar Bear on York Road in Kings Heath, also at Swordfish on Temple Street in Birmingham city centre.